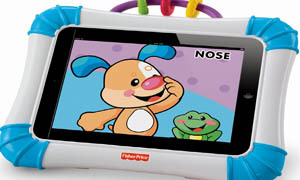 The Fisher-Price® Laugh & Learn™ Apptivity™ Case for iPad® devices lets baby enjoy high-tech fun, just like mom and dad, with their very own protective case and baby-appropriate apps! Simply place your Apple device into the case, secure the locking feature, and your iPad® device is protected from baby’s dribbles and drool, without blocking out the fun. You can block baby’s access to the home button, or keep it accessible – it’s up to you! A textured handle and rattle beads add traditional play. Baby loves variety, so you can set it up flat, as an easel or flip out both legs for a rocker base. Download FREE Fisher-Price® Learning Apps from the App StoreSM to power-up the fun, and let baby play, learn and control the action. Device not included. Compatible with all generations of iPad®. For children ages 6 months and up. The Fisher-Price® Laugh & Learn™ Apptivity™ Case for iPad® devices is a durable case that secures your iPad® behind a clear protective film. Simply place your Apple device into the case, secure the locking feature, and your iPad® device is protected from baby’s dribbles and drool. Download FREE Fisher-Price® Learning Apps from the App StoreSM that offer baby-appropriate learning with themes like shapes, colors and more. For even more fun, baby will love exploring the textured handles and rattle beads. Three modes of play offer baby lots of variety. Set the case up flat, as an easel or flip both legs for a rocking base! Designed for children ages 6 months and up, even the youngest of babies can learn through interaction and exploration with the Fisher-Price® Laugh & Learn™ Apptivity™ Case for iPad®. On-screen characters come to life through exciting sounds, surprises and visuals that will have baby wanting to play again and again. Explore your animal sound-making skills together – you might be surprised by your little one’s responses! The Fisher-Price® Laugh & Learn™ Apptivity™ Case for iPad® features a handle and rattle beads on the sturdy case to enhance fine motor skills. 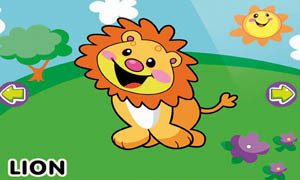 FREE Fisher-Price® Learning apps introduce baby to shapes, colors, animals and more!